We are not morning people, but somehow we managed to get up at 5 in the morning. The evening before, we had been talking with our japanese sister (she did an exchange program with AFS and lived with us for a year) and her mother about things to see. Some days before, Michelle had mentioned it could be fun to see sumo wrestling, and when they asked us that evening if we would like to see sumo wrestling, we said yes. We had not completely understood what we had said yes to. 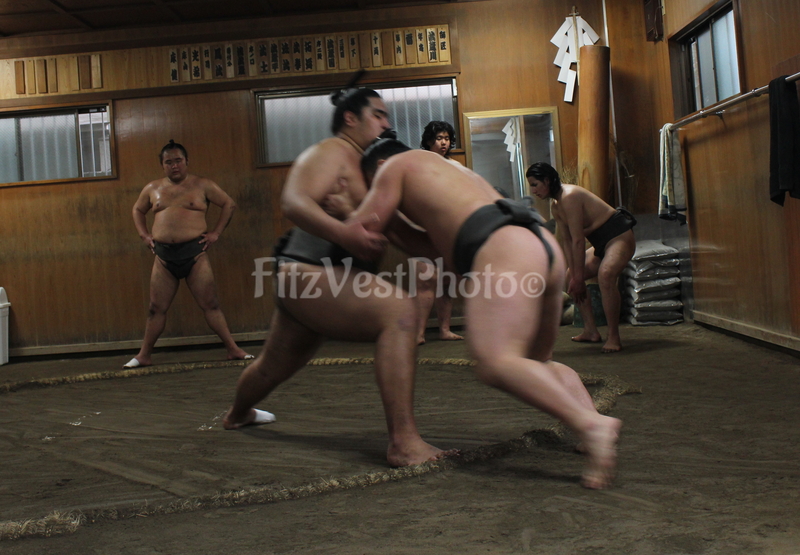 We thought that we were going to somewhere, where tourists and locals alike could come and see sumo wrestling. However, that morning we found ourselves in front of a plain door in and area that seemed just like any other. Where we exactly were, I couldn’t say. Our sister pressed a button and said something in japanese, and a moment later a young guy opened the door hardly wearing anything. So it turned out that we were in their ‘stable’, which I think you call their training room. It was just the four of us (me, Michelle, our japanese sister Masako and her mother), sitting in front of 8 guys as they practised for 1½ hour. It felt a bit strange in the beginning just sitting there looking at them, but it was definitely a very interesting experience. It was one of those that we probably wouldn’t have gotten if we had been on our own. If you get the opportunity, do take it. Afterwards we walked to the Tsukiji Nippon Fishmarket, which was buzzing with life. We were not the only tourists there, looking around. Taking in the atmosphere, we walked around looking at the many little stalls that sold tiny dried fish, fresh fish and more. We soon got hungry, having been up early, and found a sushi-place amid it all. A cup of green tea and some sushi later, we were out on the streets again. We went to the Kabukiza theatre, which shows the traditional japanese kabuki plays. No seat-tickets left, the play being over 2h and in japanese, we decided to pass. Instead we walked in to look around the other parts of the building. We found a studio, that takes pictures of people dressed up in various versions of traditional clothes. We were quickly talked into doing this, which our japanese sister and mother found entertaining.